I’m writing a special poem about feminist politics, intersectionality, and capitalism to read at the Modesto Women’s March this Saturday. I’ll be reading the poem at the rally in Graceada Park, at the terminus of the march route, around 12:30 or so. Livermore Poet Laureate Cynthia Patton hosts Poetry at Ravenswood on Sunday, October 28, from 5 to 7 p.m. at the Ravenswood historic site, 2657 Arroyo Road in Livermore. I'll be one of the featured readers. The event begins with readings by the featured poets, followed by a book signing and open mic. Admission is $5. Light refreshments will be served. Sponsored by the City of Livermore, the Ravenswood Poetry Series has featured many notable poets over its thirteen-year existence. It is held quarterly on the fourth Sunday. Next readings are July (7/22) and October (10/28). For more information contact LivermorePoetLaureate@gmail.com. I'll be reading during a designated time block (TBD) with featured poet Connie Post and other great poets at the Great Valley Bookfest in Manteca. Come stock up on your ammo at Bass Pro Shops and duck in for some literary fun at the bookfest. I'll be popping in to Kaye Osborne's Youth Writing Workshop on Tues morning to do a few fun poetry activities with kids from 5-8th grade: blackout poems and exquisite corpse. Join me as I lead a workshop on Blackout and Erasure Poetry, open to all. In the workshop, we'll look at examples of the form and see why blackout/erasure is often referred to a "poetry of absence." Using existing text provided to attendees, we'll explore ways we can frame words and create new work. For examples of blackout poetry, see http://newspaperblackout.com/ or http://erasures.wavepoetry.com/. Bring your own source text if you'd like. Newpapers will be provided as source material. At the Modesto Library, in the downstairs auditorium. Take elevator or stairs down. Refreshments provided. See you there! I am doing this talk on this day. Hope to see you! Hey, time to write you a poem. Come visit me at the Modesto Library. I'll be there with a typewriter and some words for you to choose from. Let's build a poem together. Please join me to launch a gorgeous, disturbing collection of poems into the world with a potato gun. 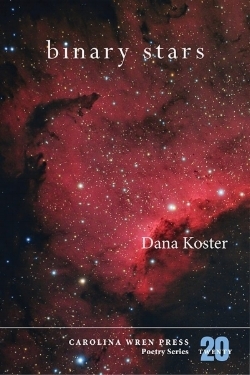 Dana Koster's first collection, Binary Stars, has won the 2016 Carolina Wren Press poetry series contest. We'll do a brief back-and-forth thing and then Dana will read. Tri-Chromatic Gallery. Be still my heart. I am so lucky to be reading with Alice Anderson, who will be reading work from her recently published best-selling collection The Watermark. Come see us at the Barkin' Dog Grill in Modesto. A Night of Music, Poetry, and Comedy. Join Lisa Erin Robertson, other Sixteen Rivers Press poets, and me at West End Café from 4:30 to 5:45 for a dandy little poetry reading. Part of SF Lit Quake. Poetry Flash presents Christina Hutchins and Stella Beratlis at Moe's Books, 2476 Telegraph Ave., Berkeley; (510) 849-2087. 7:30 pm. Reading at the 20th Annual Petaluma Poetry Walk. At the Seed Bank with Lisa Robertson and Phyllis Meshulam, 11 am. I'll be reading from and signing copies of Alkali Sink at the 10th Annual Color the Skies Hot Air Balloon & Kite Festival, along with Modesto Poet Laureate Gillian Wegener, who will have copies of her 2008 Sixteen Rivers collection, The Opposite of Clairvoyance. SIGNING: 12 - 3 pm for the both. Join us at the Mistlin Gallery in Modesto for Collision IV, a collaboration of poets and photographers paired up for an explosion of words and images. Okay, maybe I'm being hyperbolic. There will be NO actual explosions. Enjoy photographs and the poems that inspired them/were inspired by them. Coordinated by David Schroeder, Modesto Poet Laureate Gillian Wegener, and Stella Beratlis. Ain't nothing but a party. In LA. Far away from the Central Valley and life as I know it. Join us at this kickass birthday party for my pal Michael Sheppard, drummer/DJ Don Bolles, and gallery assistant Shari Bricker. Even if you don't know the birthday trio, you're invited to celebrate with music and poetry. I'm reading with Lisa Erin Robertson and Helen Wickes, and we'll be listening to radically different DJ sets from Mystery DJ #1 and Don Bolles. DJ #1 opens with vintage country and hillbilly (swoon!) from 6:45 pm to 7:45 pm; poets read from 8:00 pm (sharp) to 8:45 pm. Finally, Don Bolles spins what Don Bolles spins from 8:46 pm to 10:00 pm. I don't know exactly what that is. I only know that I will like the hell out of it. All of it. I can't wait to read at La Luz de Jesus. I heart community radio, so I'm really looking forward to talking to Fresno poet Michael Medrano about Alkali Sink and various & sundry poetry-related topics on his show, Pakatelas, later this week on KFCF 88.1fm (tagline: "free speech radio for Central California"). Sailor-mouth expressions will, alas, be bleeped out. This streams worldwide at http://www.kfcf.org/; there's no excuse, really. April 14, 2015 at 6:00 pm at Barkin' Dog Grill in Modesto. Eat, drink, poetry, plus open mic. Join us at Mrs. Dalloway's in Berkeley for our first readings celebrating the release of our new titles: Alkali Sink, The Orbit of Known Objects, and World as You Left It.